There is no other product in the mattress and bedding industry that has captured the fancy of people the way memory foam toppers have. Studies show that the difference between memory foam and other materials making up mattress toppers are so significant that the others have to achieve several groundbreaking enhancements for them to catch up with the memory foam’s pace in this industry. It is very possible that in the near future, instead of people considering other materials, they would simply be trying to figure out what brand is offering the best memory foam mattress topper. One such mattress topper that has gained quite a following among people is the Memory Foam Solutions with a 3-inch thick and 4-pound density memory foam that is perfect for a queen-sized bed. The product proudly carries the tag of made in the USA and is manufactured using methods that are certified to be Earth-friendly. No less than the stamped approval of PURGreen validates this memory foam’s adherence to the benchmarks of an environmentally-safe product. Prospective buyers are also advised to follow the instructions to be able to maximize the most out of this product. It may take around 96 hours for the memory foam to fully expand and reach its normal height when opened under temperatures hovering around 72 degrees. Users are also informed beforehand that a slight smell coming from the memory foam is to be expected. Although this might be irritating, particularly to those with a keen sense of smell, the manufacturers guarantee that the odor will not cause any allergy. Owners of this product can remedy the situation by opening the windows and door of the room so air can circulate. It should only take a few hours of excellent ventilation for the odor to disappear. Cleaning the sheets can also help remove the smell. In some cases, though, the smell was not even noticeable that they were able to enjoy this product after the recommended hours for expansion was followed. Safety from very harmful chemicals and procedures that can cause destruction to the environment should be always near the top of almost every product. The Memory Foam Solution is certified by PURGreen, which can be considered as the authority in this field regarding this type of product. Besides the PURGreen, other bodies such as the EPA and CSPC have also given their seal approval of this product’s safety. Memory Foams usually have a distinct smell that can last for a day or two. With this seal of approval, it means that even the distinctive odor is non-toxic. Most experts consider the 4 pounds as just the right density for a memory foam to give the right mix of cushioning and support. It is this density that pressure points are perfectly lessened for a wide variety of people. 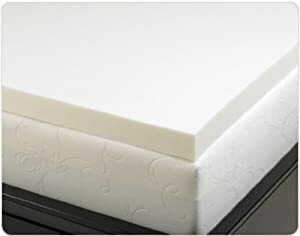 The memory foam also adapts and holds very well to the user’s form, which should mean a very good night’s sleep. Again, this is a figure experts generally consider to be recommended for people of various weights. This will be a very nice complement to the 4-pound density. Some of the buyers found the 96-hour recommended expansion time to be too much. While there are those who were able to enjoy their memory foam toppers a few hours after opening, there were also those who were left disappointed with the waiting time. This is something that is often found in all memory foams regardless of brand. The good thing is, this product’s smell is not toxic or harmful. The Memory Foam Solutions with 3-Inch Thick Visco Elastic Memory Foam Mattress Pad, Bed Topper, Queen, 4-Pound Density is a very solid option in making a night’s sleep comfortable and pain-free. This is one of those products that verified users have been generally very happy about. It is also very reasonably-priced, which lets buyers get the most out of their investment.